How many kinds of gigs are there? There’s always a mate’s band and if you’re lucky you won’t have to pretend they’re good. You’ll see overhyped bands in underground clubs with foot-high stages and variable outcomes. You’ll tolerate arenas or stadia to see the artists who’ve always meant the world to you and you’ll feel the pang of songs that have been embedded into your consciousness. For the amount you’re paying these days, 50 quid up, it should be worth it. You might take a chance and find a show unexpectedly enjoyable, not to mention eccentric (as I did last week seeing bass legend Les Claypool – more avant-garde jazz funk experimentation than you could bend a Larry Graham thumb at). The better experiences last in the memory at least until the next gig. But if, by some miraculous alignment, you combine good judgement and luck on a particular night, you witness a show that you know you’ll be talking about for years to come. I felt that way the first time I saw Arcade Fire, when I knew not one of their songs, in May 2005 at the Astoria. 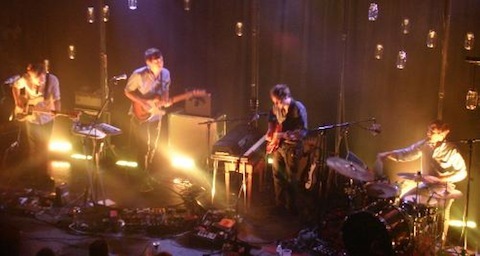 And I felt that same way last Sunday, as I stood in spellbound shock after Grizzly Bear’s last chord had faded. More of a double bill than a support slot and headliner, I also can’t remember enjoying an opening act as much as I enjoyed Baltimore’s sublime Beach House. I swooned as French-born Victoria Legrand’s soaring, sonorous voice reached into every nook of the Roundhouse’s columns and circus-top roof. Their new album, Teen Dream, one of my favourites of the year so far, resurrects a Cocteau Twins dream pop feel I thought was lost a generation ago. Mac loops, jangly guitars, keyboards and that voice: it won’t be long until they’re filling the venue by themselves. And so, to Brooklyn’s Grizzly Bear. Where on earth do these songs come from? Walls of dense noise, musicianship connected on a cellular level, climactic epic sounds, gentle psychedelic pop floated up to the Roundhouse balcony as lanterns flickered across the stage; all this from four young men who play without displaying any of the arrogance that should be inevitable in a band this good. When you think of how much praise powerful but derivative acts like Kasabian get, you feel like shaking record (CD/digital) buyers by the shoulders and saying come on, listen to this, music can be so much more than the pedestrian big-chorus-and-nothing-else Kings of Leon/Killers rock we’re all being force-fed. It can be more than churned out formulaic electro or Cowell-created packaging. This joyous magical music comes from the Radiohead end of that spectrum – no wonder they’re Jonny Greenwood’s favourite band. Veckatimest was 2009’s best album, a headphones record that washes over you, a sonic pleasure. The show as a whole and the performance of those songs improved on recorded perfection. I just stood there in shock, taking in the harmonies and the instruments – yes, drums and guitars but also a Rhodes organ, flute, clarinet, glockenspiel and Autoharp – as it all went by in a haze. It was a special night and everyone there knew it. Some say all the chords have been used, all the great songs have been written. Not for them. It felt like a step forward.